Published to commemorate the fortieth anniversary of General Augusto Pinochet’s infamous September 11, 1973, military coup in Chile, this updated edition of The Pinochet File reveals the shocking, formerly secret record of complicity with atrocity on the part of the U.S. government. 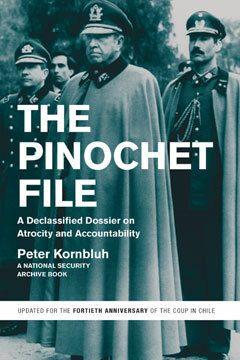 The book now completes the file on Pinochet’s story, detailing his multiple indictments between 2004 and his death on December 10, 2006, including the Riggs Bank scandal that revealed how the dictator had illegally squirreled away over $26 million in ill-begotten wealth in secret American bank accounts. When it was first released in hardcover, The Pinochet File contributed to the international campaign to hold Pinochet accountable for murder, torture, and terrorism. A new afterword tells the extraordinary story of Henry Kissinger’s attempt to undercut the book’s reception—efforts that generated a major scandal that led to a high-level resignation at the Council on Foreign Relations, illustrating the continued ability of the book to speak truth to power.